Jakarta, with its 9.58 million population experiences all of the above-mentioned effects of climate change. But the greatest climate change and disaster-related risk facing Jakarta is floodings, which inflicted very high human and economic detriment on the city. The most affected people are the urban poor, which constituted 3.5% of the population. They are highly vulnerable because they live in the riverbanks and canals. The poorest people in Jakarta settled in self-constructed settlements, usually on land without formal legal title. This situation creates a problem with the local authority and so often leads to clashes with the settlers. At the same time, the people regarded the provincial government incapable of managing the city. Migration is another problem that haunt Jakarta if the government does not have a good policy for the city in the coming years. The combination of climate change effects and social vulnerability may lead to escalated conflict between the local authorities and the urban poor, especially when the local government includes the use of force in managing the problems. Jakarta is the economic, political, and cultural hub of Indonesia. The Dutch colonial government founded the city and designed to accommodate 800,000 people. However, the centralization policies during the Suharto's office cause the city to expand to more than 9 million inhabitants. In working weeks, Jakarta is said to accommodate 12 million people. People from all over the country come to Jakarta to find livelihoods and to settle down. According to 2010 UNFPA data, about 43 percent of Indonesians live in urban areas. It is projected that by 2020, two out of three Indonesians will live in cities. Data from the Population and Civil Registration Agency show that there were 109,617 post-holiday newcomers in 2007, 88,473 in 2008, 69,554 in 2009 and 60,000 last year. Jakarta expects to see less than 50,000 new arrivals this year. The images above are image of the land use of Jakarta in the year 1976, 1989, and 2004. 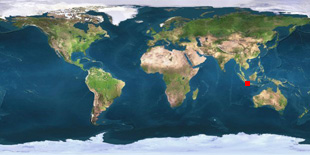 The images use satellite observations of visible and infrared light reflected by the Earth's surface to enhance the contrast between land surface types. Vegetation, which reflects infrared light very strongly, appears red, and urban areas appear light green. Each image in this series covers an area of 49 by 49 kilometers and is centered near 6.2 degrees South latitude, 106.8 degrees East longitude. Clean water is one of the issues faced by the population. The current piped system of drinking water is ineffective, therefore 80% of Jakarta inhabitants use the underground water which has become steadily depleted. In low-lying North Jakarta, groundwater depletion has caused serius land subsidence, making the area more vulnerable to flooding and allowing sea water from the Java Sea seep into the coastal aquifiers. Along with sea level rise and increased rain fall, land subsidence is one of the greatest challenges facing Jakarta. Another serious issues is housing. Jakarta is unable to provide housing for all the inhabitants. Skyrocketing land prices and rampant private sector development that is under-regulated has resulted in a booming real-estate market that excludes the poor. Large informal settlements have grown over many years along waterways, natural rivers, reservoirs, contributing to the pollution and clogging of the areas. The local government often use this to blame the public for flooding that occurs. On the other hand, the public accuse the authority corrupt because they keep issuing permits for the development of business and industries facilities such as shopping malls and factories that are not environmentally friendly. The Urban Risk Assesment (URA) of Jakarta reported that "the main hazards for Jakarta relate to water management and flood control. Extreme weather events cause overloading of the existing drainage system, while sea-level rise coupled with land subsidence is making Jakarta increasingly vulnerable to tidal floods due to its coastal location. Jakarta has also experienced earthquakes (although minor, but as recently as 2009) and should be prepared for other unprecedented geological events and tsunamis." Property damage, business damage, tainting of ground water, loss of life, spread of disease and refuse. Depending on severity can affect traffic circulation, business activity, damage to property, power outages, displacement, and spread of disease. Loss of property and businesses, spread of illness and loss of life, loss of access to clean water. Locally known as rob, extreme tidal floods from the sea have become more serious in the past few years in the coastal areas of the city. Seawater intrusion into aquifiers. Seawater intrusion into drinking water, damage to property including boats, halt of industry and mobility. As a result of both urbanization and loss of green space, increases in ground temperature and resulting instances of dengue. Loss of life due to dengue, usually in a very poor communities. The public and the media have expressed negative sentiments towards the provincial government over the two major floods in 2002 and 2007. The Jakarta Post during the 2007 floods ran an editorial that said, "if any head must roll for the poor handling of the disaster, it is Sutiyoso's (the then governor), and his alone. 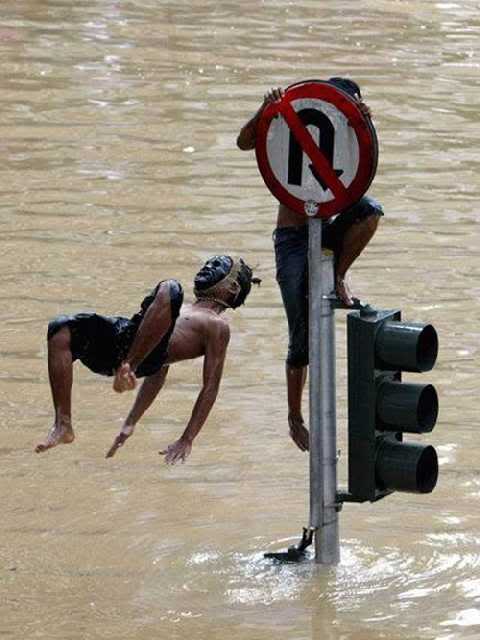 It is simply unforgiveable for a governor to see two major floods hit the city, and on both occasions leave the citizen helpless (Jakarta Post, 5 February 2007)." The governor is elected by the people since 2007, however, criticsm and mistrust towards the local authority are the norm among the Jakartan public. Florian Steinberg in his paper for the Habitat International asserts that “the administration’s budget is often criticized for not reflecting the ‘‘priorities of the people’’ (Jakarta Post 11 January 2002). While the city budget is generous in allowance for the Governor and his top officials as well as the members of the Provincial Council, there is a chronic phenomenon of under-spending of the development budget. In the last years, the pattern has always been that during the first 6 months of a year the city administration was only able to spend a mere 25% of the development (investment) budget, while during the second half of the year the expenditure of funds was either haphazardly accelerated or money was not spent at all since project preparation and procurement took up much more time than anticipated.” Clearly, a better budget utilization is urgent on this matter. The major floods take place every 5 years. The first major flood was in 2002, followed by the largest floods of the city's history in 2007. It is predicted to take place again in January 2012. Jakarta is located on the north coast of the island of Java in the Indonesia archipelago in Southeast Asia. Often referred as a big city, Jakarta is actually a province that comprises of five municipalities Central Jakarta, North Jakarta, East Jakarta, West Jakarta, South Jakarta, and Thousand Islands regency. Central Jakarta (population: 889,448) is the most densely populated and a home of to most of the city’s skyscrapers. North Jakarta (population: 1,445,623) is the most climate change affected neighborhood because of its proximity to the coastal area. East Jakarta is the most populous district with 2,391,166 residents. West Jakarta has a population of 2,093,013 residents. South Jakarta is considered the most well-off neighborhood with a population of 2,001,353 people. Thousand Islands comprises about 110 big and small islands, and is a tourism spot. People live in Jakarta representing nearly all the ethnic groups in the archipelago. The major groups are Sundanese, javanese, Chinese, and the native Betawi. Other large groups are the Minangkabau people, the Bataks, the Manadonase, and the other people from Sulawesi and the Ambonase. The provincial government holds the utmost responsibility of the situation in Jakarta. They have been regarded as incapable of managing the city, and that their policy is excluding the poorest communities of Jakarta. The public of Jakarta has the role to push the local government to formulate better policies that is pro-poor and environmentally friendly. The business people in Jakarta are able to play an important role by running their business with an environmental awareness in mind. They also can play a role in incorporating environmental project on their corporate social responsibilities programs. A study conducted by The Center for Sea and Coastal Development at Bandung’s Institute of Technology (2007) concluded that the sea water level off the coast of Jakarta increased by 0.8 meter. 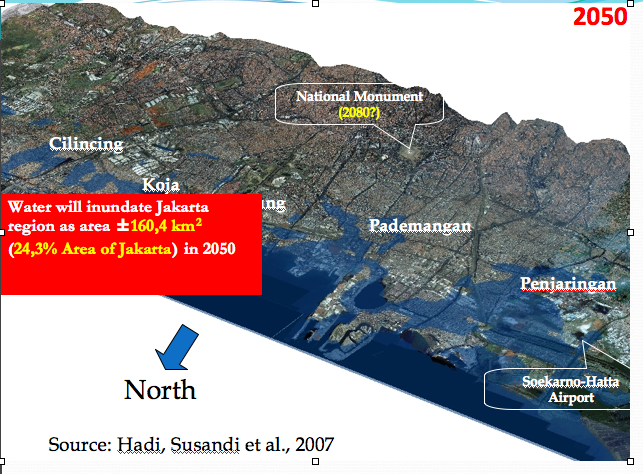 It was also projected that by 2050 some areas in Jakarta, such as Kosambi, Penjaringan, and Cilincing will be under water if global warming continuous at the current pace. The sea level rise is projected to inundate most of Central Jakarta and will likely cause a significantly large socio-economic impact. Climate related hazards that frequently occurred in Kamal Muara (Penjaringan Sub-district) are sea level rise, flood caused by sea water or high tide, and climate uncertainty. The Coastal Vulnerability Index (CVI) Mapping of Jakarta, Tangerang, Surabaya, Pekalongan, and Bekasi by Board of Ocean and Fisheries Researh (2009) using Haesller & Timmer, USGS (2001) has shown that there are 4 (four) sub-districts in Jakarta which experienced flood caused by Sea-Level Rise. Fifty percent reduction in urban green space would bring air temperature to rise between 0.4 to 1.8 degree Celcius and automobile density is found to be the most important cause of urban heat island in Jakarta. Based on a study by Haryanto (2009), diseases stemming from vehicular emissions and air pollution include acute respiratory infection, bronchial asthma, bronchitis, and eye and skin irritations (Boer et al., 2007) and it has been recorded that the most common disease in northern Jakarta communities is acute upper respiratory tract infection – at 63% of total visits to health care centers (Indriyanti and Pedrique, 2006). Water scarcity is an additional issue as a result of global and regional climate change in which between 2010 and 2015 the country is predicted to experience a major clean water shortage, and this is expected to occur mainly in urban areas (Boer et al., 2007). Air pollution is proven to be a major environmental hazard to residents in Jakarta, regardless of their socio-economic status. Transportation comprises 27 % of Indonesia’s GHG emissions, and traffic congestion is a huge problem in Jakarta (Pelangi, 1999). (Excerpted from their study titled "Jakarta City Report: Information Related to Climate Change in Jakarta City" in 2010 with necessary changes). Jakarta is located in a deltaic plain crisscrossed by 13 natural rivers and more than 1,400 kilometers of man-made waterways. 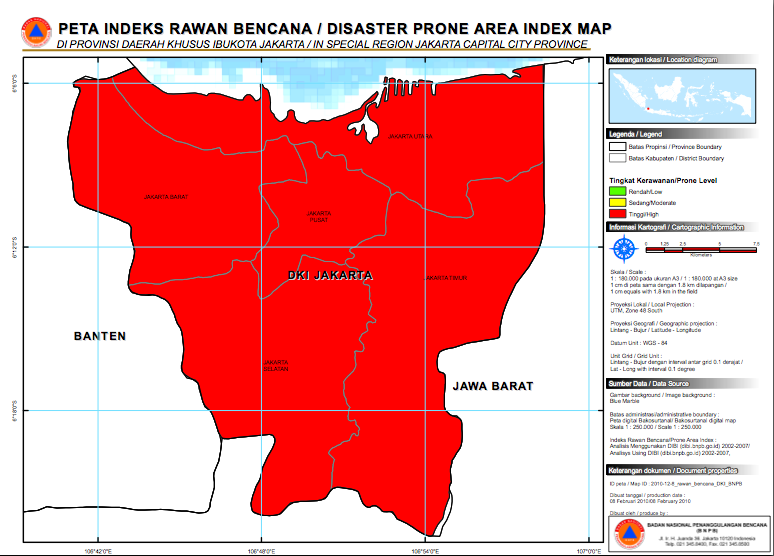 About 40% of the city, mainly the area furthest north near the Java Sea, is below sea level. Geologically, the whole plain consists of Pleistocene sediments contained in the 50 m below ground surface. The southern part of Jakarta consists of alluvial layer, and coastal lowlands are being stretched to the countryside about 10 km. At the bottom, the older sediment layers do not appear on the surface of the soil because they are entirely buried by alluvium deposits. In the northern part of the new found, at a depth of 10-25 m, increasing to the south of the shallow hard surfaces 8-15 m. In certain parts there is also a hard ground surface layer with a depth of 40 m.
The area along the coast, northern Jakarta, is also potential for massive migration in the event of the realization of the inundation scenario by the 2050. Currently, the conflict between the people and the local authority is not an overt one. Negative sentiments and blaming each other over the disasters and social problems are expressed in the daily conversation as well as in the media. However, some clashes have taken place in the event of evictions of the poor people live in the illegal settlements such as along the riverbanks and canals. Environmental project such as the building of sea walls in the northern part of Jakarta is potential of violent conflict if the local government include the use of force to remove people fom their illegal settlements. Migration and business disruption will also be problems whenever the hypothetical inundation by 2050 actually become reality. Java island, where Jakarta is located, is the most densely populated island in the country, migration from Jakarta will affect the social and political stability in the migration destination as well as in Jakarta itself. Human casualties have yet occured in the conflict between the local authority and the people. Climate change causes more disasters as the temperature and sea level rises. The rising of the temperatures causes more floods, droughts, and more failed crops. Located in the tropical climate where the temperature is naturally warm, the rising of the temperature in Jakarta affects the lifestyle of the vast population. The people overuse the vehicles and air conditioner, which resulted in severe air pollution. In turn, air pollution affects the temperature to rise, and this situation creates a cycle that exacerbated one another. The raising sea levels and temperature affects the fishermen in terms od decreasing fich catch. Indonesians are agrarian in nature. They used to be farmers and fishermen. Today, there is a decreasing tendency of people choosing to be farmers and fishermen as their occupation. Agrarian lifestyle can no longer ensure their livelihoods due to the uncertainty of the climate. People from all over the country are attracted to migrate to Jakarta because it offers more jobs and it causes overpopulation to the city. The environmental problem in Jakarta is also caused by the poor awareness of the population and authorities dealing with environmental issues. Environmental matters are considered less significant compared to economic growth. The provincial government focuses on the development for economic purposes such as building shopping malls, hotels, residences. The business people do not have the environmental awareness as well. These environmentally-poor practises are also being taken for granted by the authority which leads to mismanagement of environmental aspects. 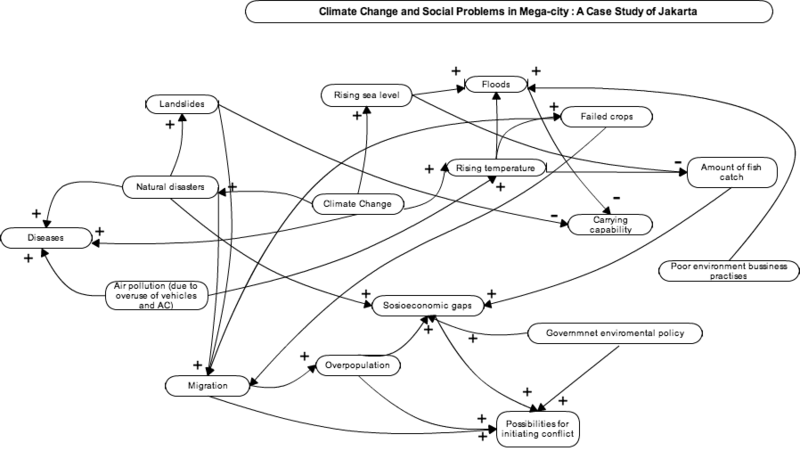 The combination of natural disasters, man-made disaters and urbanization, lead to overpopulation and broad socioeconomic gap, which in turn will be the sources of social vulnerability in mega cities such as Jakarta. Since the environmental problems usually have more effects to the poorer poopulation, the local authority does not prioritize them. They keep issuing permits to build more shopping malls and other facilities that sacrifices the environmental aspect. Their policies are not considered pro-poor. The people and NGOs are calling for urgent attention from the local government for this matter. The indifference from the local government may increase the possibility of initiating conflict between the people and the government. Violence may occur when the authority relies on the use of force to manage the problem. Jakarta is the most important city that serves as the center of political and economic activities in the country. Any major disruptions in the city will have implications in the national level. There has been no overt violence dispute until now. However, potential violence may involved, in terms of the forced removement of the illegal settlers in slums areas in Jakarta. Webersik, Christian. Climate Change and Security: A Gathering Storm of Global Challenges. Santa Barbara: Praeger, 2010.